Lots of aspiring metal musicians have the fantasy of reading about their band on the pages of Hit Parader, and for Victor Langen, the bassist in Kick Axe that dream has come true. 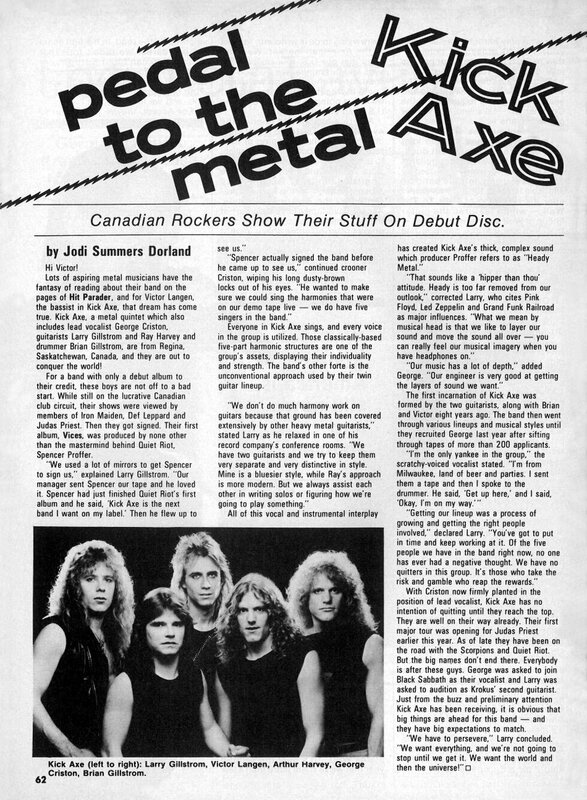 Kick Axe, a metal quintet which also includes lead vocalist George Criston, guitarists Larry Gillstrom and Ray Harvey and drummer Brian Gillstrom, are from Regina, Saskatchewan, Canada, and they are out to conquer the world! For a band with only a debut album to their credit, these boys are not off to a bad start. While still on lucrative Canadian club circuit, their shows were viewed by members of Iron Maiden, Def Leppard and Judas Priest. Then they got signed. 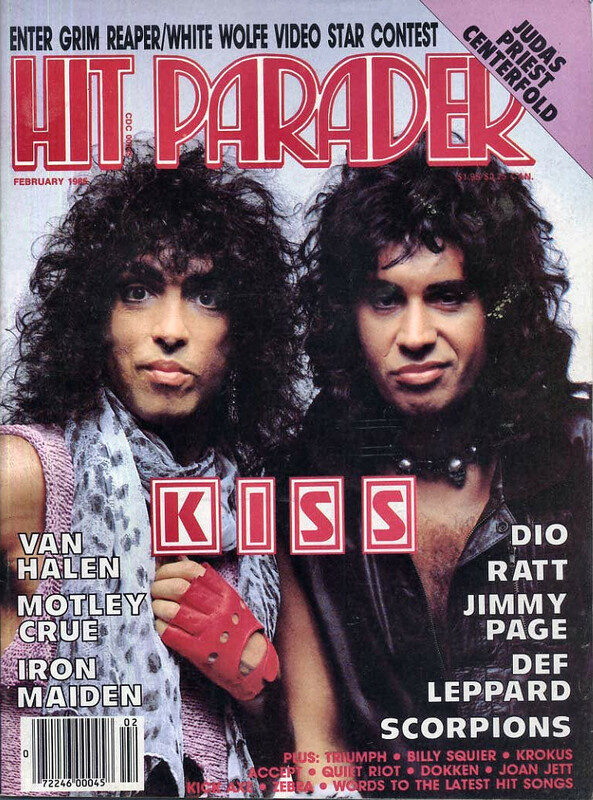 Their first album, Vices, was produced by none other than the mastermind behind Quiet Riot, Spencer Proffer. "We used a lot of mirrors to get Spencer to sign us," explained Larry Gillstrom. "Our manager sent Spencer our tape and he loved it." 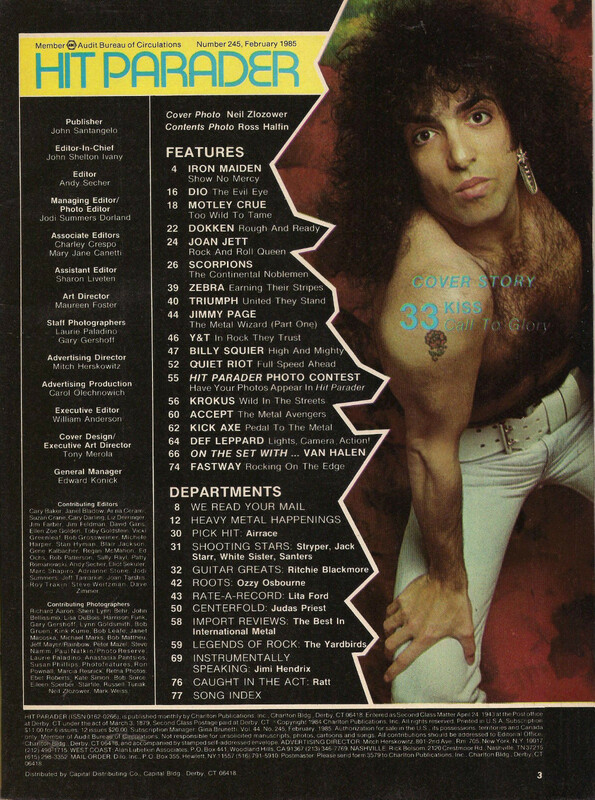 Spencer had just finished Quiet Riot's first album and he said, "Kick Axe is the next band I want on my label. Then he flew up to see us." "Spencer actually signed the band before he came to see us" continued George Criston, wiping his long dusty brown locks out of his eyes. "He wanted to make sure we could sing the harmonies that were on our demo tape live - we do have five singers in the band." Everyone in Kick Axe sings, and every voice in the group is utilized. Those classically based five-part harmonic structures are one of the group's assets, displaying their individuality and strength. The band's other forte is the unconventional approach used by their twin guitar lineup. "We don't do much harmony work on guitars because that ground has been covered intensively by other heavy metal guitarists", stated Larry as he relaxed in one of his record company's conference rooms. "We have two guitarists and we try to keep them very separate and very distinctive in style. Mine is bluesier style, while Ray's approach is more modern. But we always assist each other in writing solos or figuring how we're going to play something." All of this vocal and instrumental interplay has created Kick Axe's thick, complex sound which producer Proffer refers to as "Heady Metal". "That sounds like a 'hipper than thou' attitude. Heady is too far removed from our outlook," corrected Larry, who cites Pink Floyd, Led Zeppelin and Grand Funk Railroad as major influences. "What we mean by musical head is that we like to layer our sound and move the sound all over - you can really feel our musical imagery when you have headphones on." "Our music has a lot of depth," added George. "Our engineer is very good at getting the layers of sound we want." The first incarnation of Kick Axe was formed by the two guitarists, along with Brian and Victor eight years ago. The band then went through various lineups and musical styles until they recruited George last year after picking through tapes of more than 200 applicants. "I'm the only Yankee in the group," the scratchy voiced vocalist stated. "I'm from Milwaukee, land of beer and parties. I sent them a tape and then I spoke to the drummer. He said, "Get up here," and I said "Okay, I'm on my way." "Getting our lineup was a process of growing and getting the right people involved," declared Larry. "You've got to put in time and keep working at it. Of the five people we have in the band right now, no one has ever had a negative thought. We have no quitters in this group. It's those who take the risk and gamble who reap the rewards." With Criston now firmly planted in the position of lead vocalist, Kick Axe has no intention of quitting until they reach the top. They are well on their way already. Their first major tour was opening for Judas Priest earlier this year. As of late they have been on the road with Scorpions and Quiet Riot. But the big names don't end there. Everybody is after these guys. George was asked to join Black Sabbath as their vocalist and Larry was asked to audition as Krokus' second guitarist. Just from the buzz and preliminary attention Kick Axe has been receiving, it is obvious that big things are ahead for this band - and they have big expectations to match. "We have to persevere," Larry concluded. "We want everything, and we're not going to stop until we get it. We want the world and then the universe!"